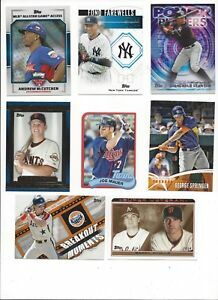 2014 TOPPS INSERTS (ROOKIE RC's, STARS, HOF) - ALL LISTED - WHO DO YOU NEED!!! Details about 2014 TOPPS INSERTS (ROOKIE RC's, STARS, HOF) - ALL LISTED - WHO DO YOU NEED!!! Arrived extremely quickly in outstanding condition. Thanks! Good set of cards and transaction !! !